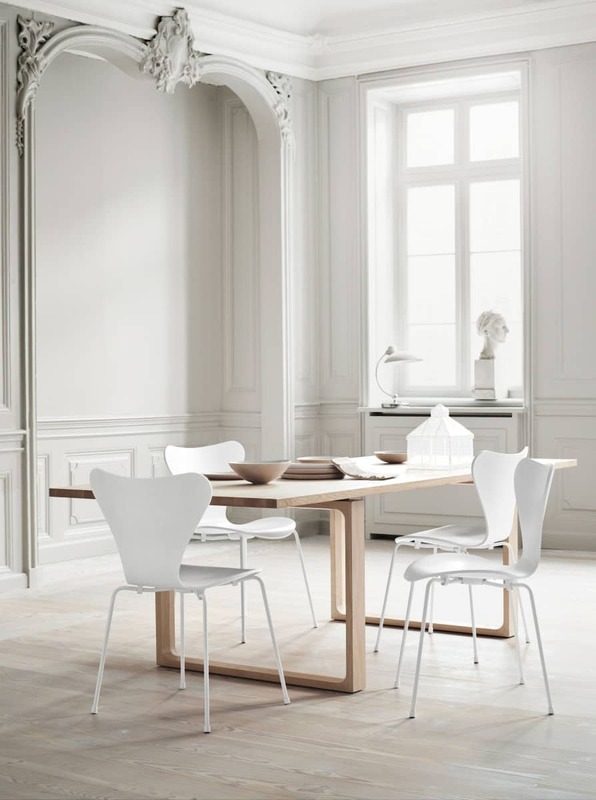 Modern dining chairs are design masterpieces. Forget boring unassuming shapes and simplistic lines. Even the most basic of these chairs look elegant and designing. 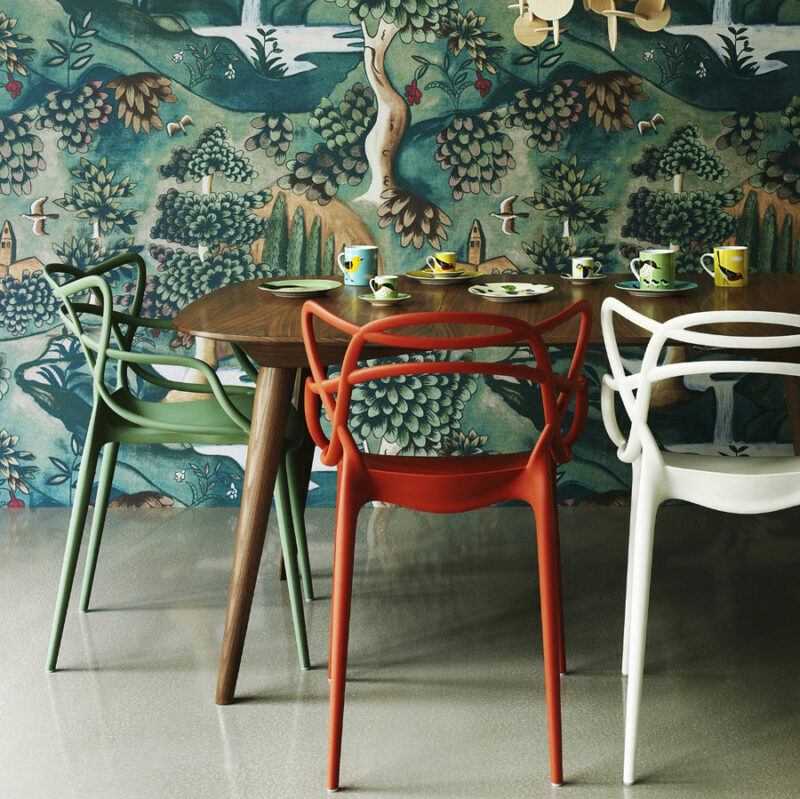 From mid-century modern icons to contemporary eye-candy, dining chairs still pretty much rule the dining room interiors. 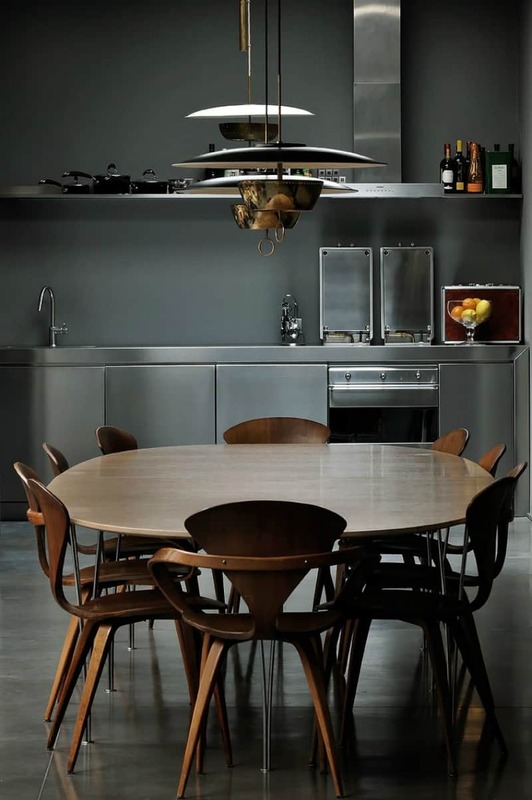 Cherner Arm Chair was a 1958 concept child of Norman Cherner, which was also turned into a side chair that now decorates countless dinings rooms, breakfast nooks, and kitchens. Elegant but simple curvy shape gives it a very attractive look while molded plywood looks mid-century-modern chic. 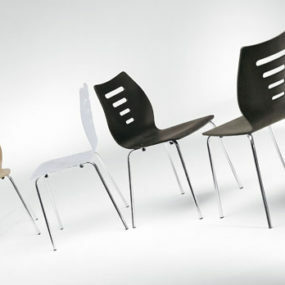 Series 7 chairs by Arne Jacobsen come in ten different veneers, including cherry and oregon pine. Designed in 1955 it is a classic mid-century modern design that will bring a note of nostalgia to any contemporary dining room. Available in a slew of colors and finishes as well as upholstered variants, model 3107 spawned an entire crowd of similar seats that you can find on the market. 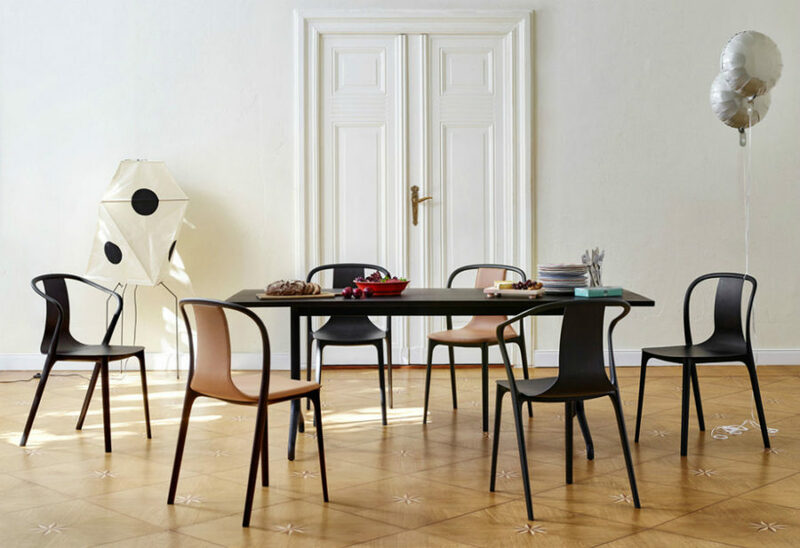 Wishbone Chair was conceived by Hans J. Wegner for Carl Hansen & Søn in 1949. Inspired by Ming Chairs and not at all by an actual wishbone, the design that is also known as ‘Y’ is still made with paper cord (durable material since WWII) to ensure premium quality. 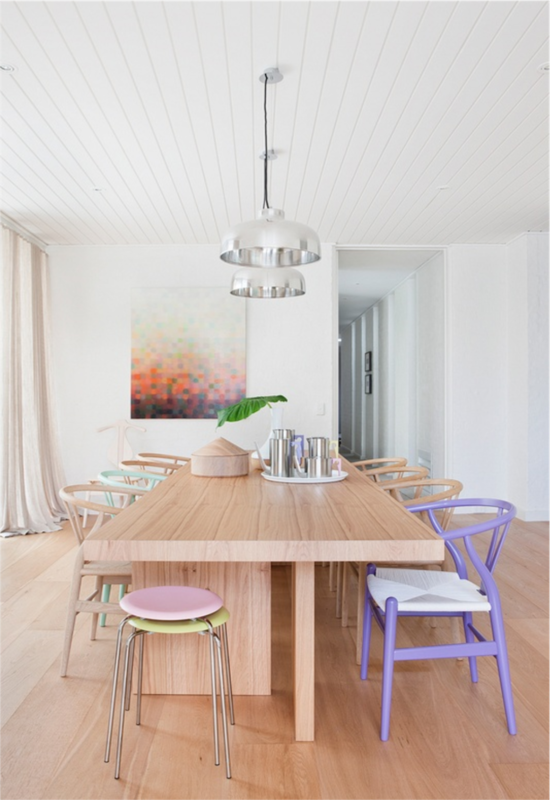 While wooden finish will give your table a mid-century modern vibe, the colored versions will instantly bring a pop of attractive color to the interior. Risom Side Chair was amongst the first furniture designs commissioned and manufactured by Knoll to later earn the brand its reputation for modern design. Created during war in 1943 the chair had to be made out of discarded parachute webbing, which gave it its iconic look that works even today. You probably saw Panton Chair Classic countless times. Surprisingly contemporary-looking the plastic chair was prototyped by Verner Panton in 1959-1960 with Vitra and went into production seven years later. Its uniform molded shape distinguishes the chair from such classics as Eames fiberglass chair that has a similar backrest shape. Eero Saarinen created his Executive Chair back in 1950, bringing a twist to uniform mid-century shapes. It is the partially open back that gives it an elegant flair and exquisite silhouette. Suited for both office and dining room Executive comes in sophisticated neutrals as well as the popping brights. In 1952 Harry Bertoia turned industrial steel into functional but charming chairs that today come in a range of colors and finishes. 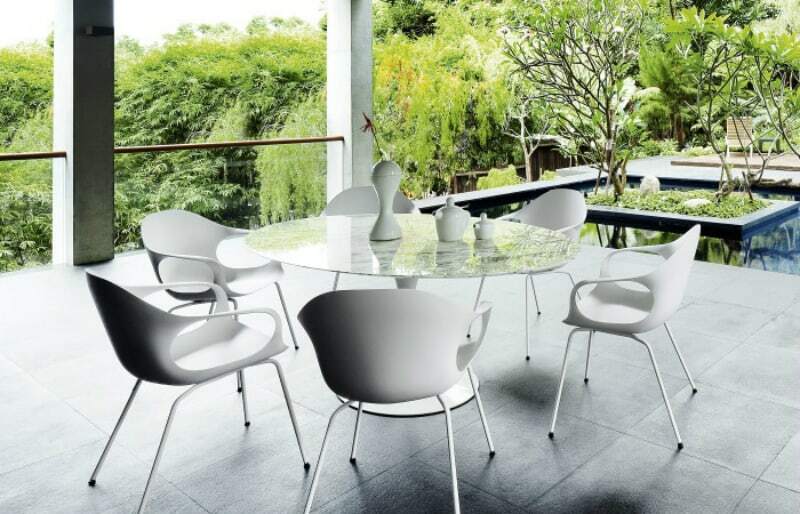 The chairs with vinyl seats are ideal for outdoor space, their airy backrests allowing surrounding views to be seen through. 1966 Platner Collection from Knoll was filled with modern shapes that were both decorative and elegant. Made of molded fiberglass with a molded latex foam cushion the Platner arm chair is a gorgeous pedestal seat that will make your guests feel ultra special. 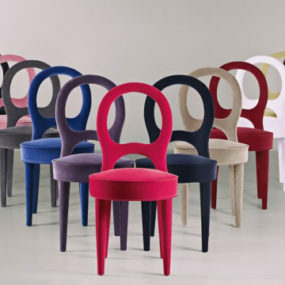 Like Panton it has a uniform shape that flows from a rounded backrest to a quite slender base made of welded steel rods. Vegetal Stacking Chair is the epitome of contemporary design. Though deriving its style from organic vegetation, Vegetal looks exceptional still. 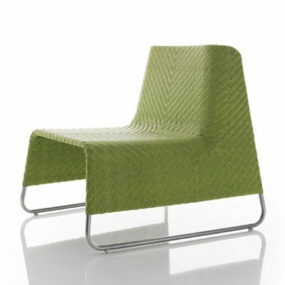 Dyed polyamide further promotes its contemporary feel, additionally rendering it a great outdoor seat. Masters Arm Chair is probably the most recognizable contemporary seat created by Philippe Starck and Eugeni Quitllet just six years ago. 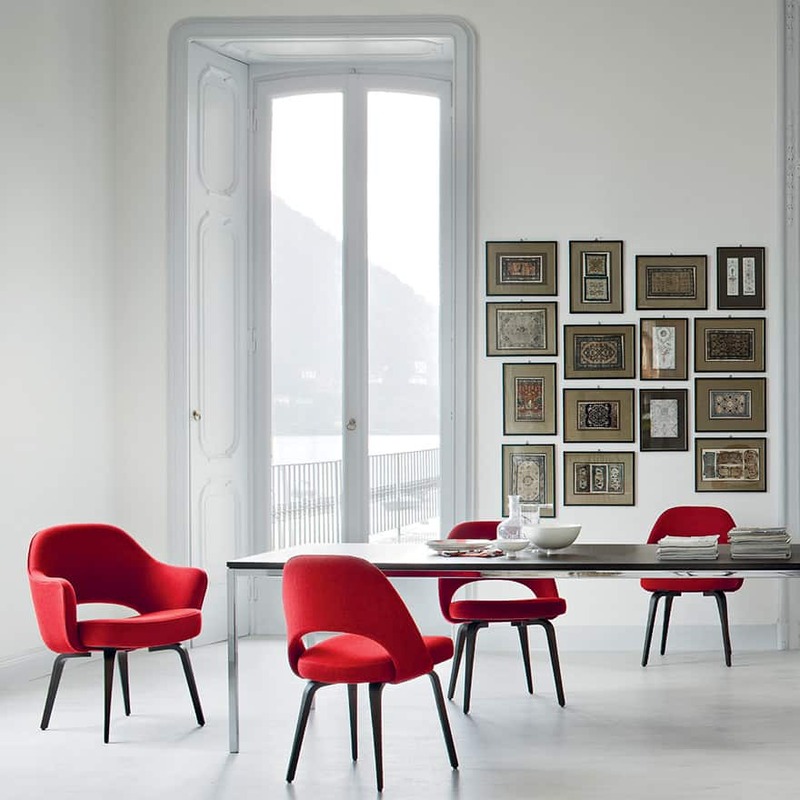 Combining the elements of three iconic chairs such as Series 7, Eero Saarinen’s “Tulip Armchair” and the “Eiffel Chair” by Charles Eames, Masters won the 2010 Good Design Award followed by 2013 Red Dot Design Award. Modified batch-dyed polypropylene allows both indoor and outdoor use and a wide assortment of colors ensures its compatibility with almost any color scheme. Real Good Side Chair from a modern furniture brand Blu Dot stands out not only because of its polygonal powder-coated steel frame but also because it is way more affordable than any of the previous designs in our list. Combining practicality and aesthetic properties of metal, Blu Dot created a seat that is both sturdy and attractive. The only question is that of comfort. Designed in 2003 by Konstantin Grcic Magis Chair One seems like an ode (or is it a nod?) to contemporary architecture. Made of aluminium the angular chair features a convenient handle built into its backrest as well as minimal armrest. Versatility of contemporary design never ignores multi-functionality, so Magis can also double as an outdoor furniture piece. 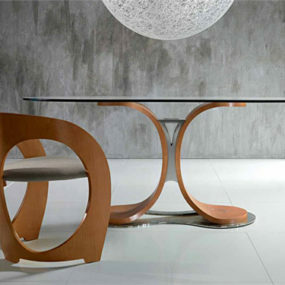 Lili Chair is one of the designing creations of a furniture wizard Christopher Guy. Known for modern dining chairs of “a contemporary mood with classic values”, he offers dining chairs so fabulous it’s hard to take your eyes off of them. Displaying his signature crossed back legs, Lili sports a plush high seat that looks best in a combination of a dark frame and dusty pink fabric. 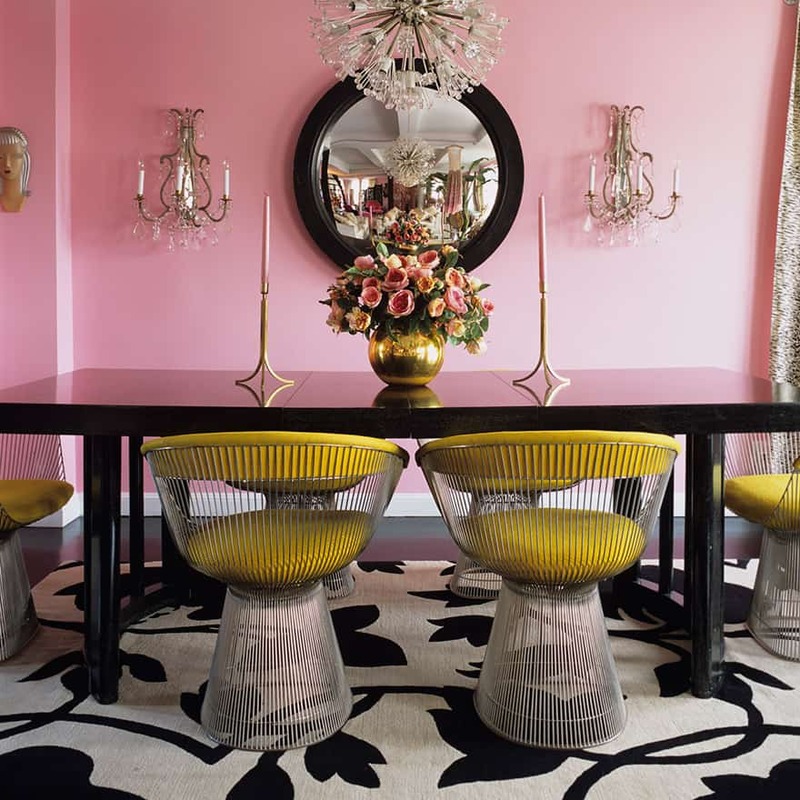 True to his impeccable style Jonathan Adler created a dining chair that combines the best of every tradition. Its frame is simple and modernist, seat is streamlined and contemporary, and general aesthetic is pleasantly formal. Available in just two colors it looks extremely luxe and beautiful, which further convinces us that there’s no better pair in design than velvet and golden brass. 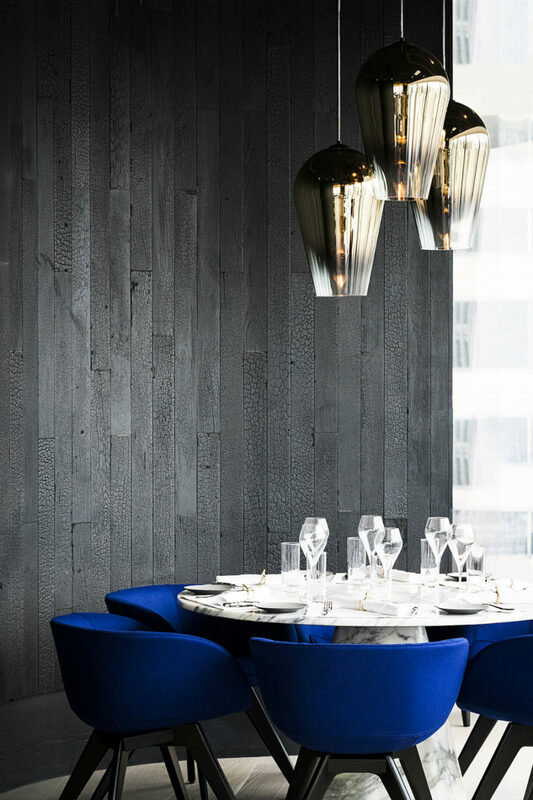 Tom Dixon is a known lighting designer, but here is his dining seat called Scoop Chair that can really capture attention from afar. 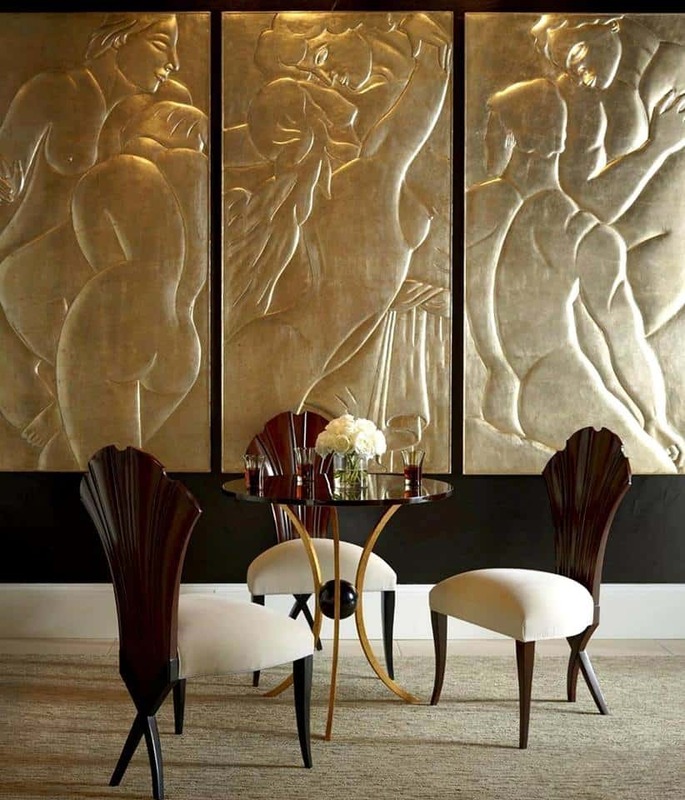 Sculptural and incredibly luxurious it comes with brass legs and in different fabrics. These royal blue chairs are both elegant and bright. 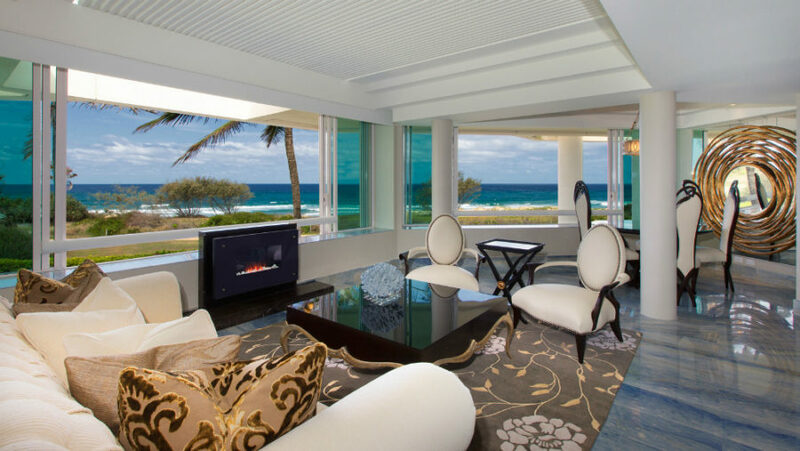 A perfect addition to a contemporary luxe residence. Amelie Chair is a peculiar design because it is both contemporary and very modernist. Highly comfortable upholstered body shows simple yet elegant lines. And its details are subtle and practically non-existent. Its stain-resistant fabric ensures the chair is easy to maintain while its simple aesthetic allows it to find a place in almost any modern interior. 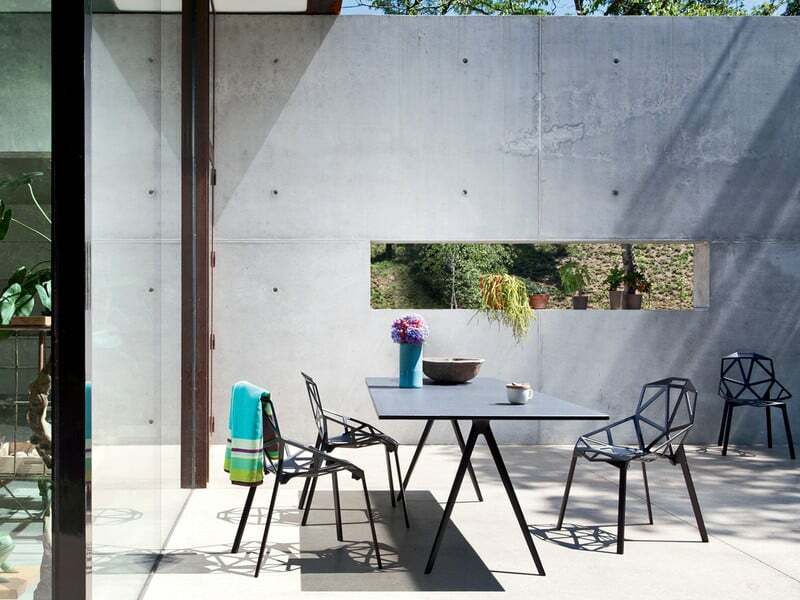 Ronan & Erwan Bouroullec’s Belleville chair looks distinctly familiar, but at the same time pleasantly contemporary. Streamlined and sophisticated chair from a Parisian cafe it comes with armrests as well as in a range of different finishes. 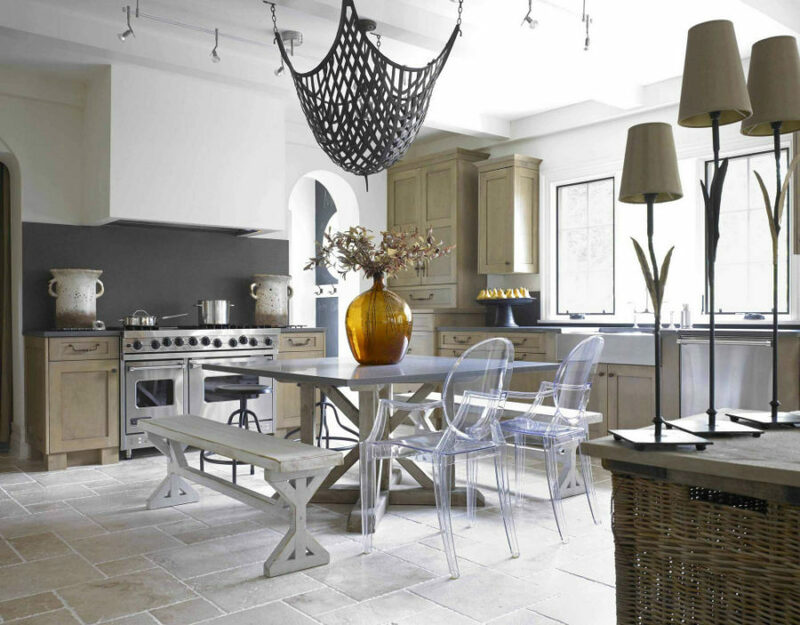 Fabric and leather covers lend it a more homely feel while wooden seat shells add a bit of modernist vibe to the design. Fanuli’s Elephant Chair is an epitome of modern design. Created by Neuland Industrie Design for Kristalia in Italy the chair is simple and functional and yet has a certain charm about it. 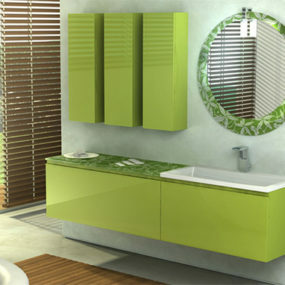 Its hard polyurethane frame comes in a variety of hues including rich Olive Green, and epoxy finish for outdoor variants. 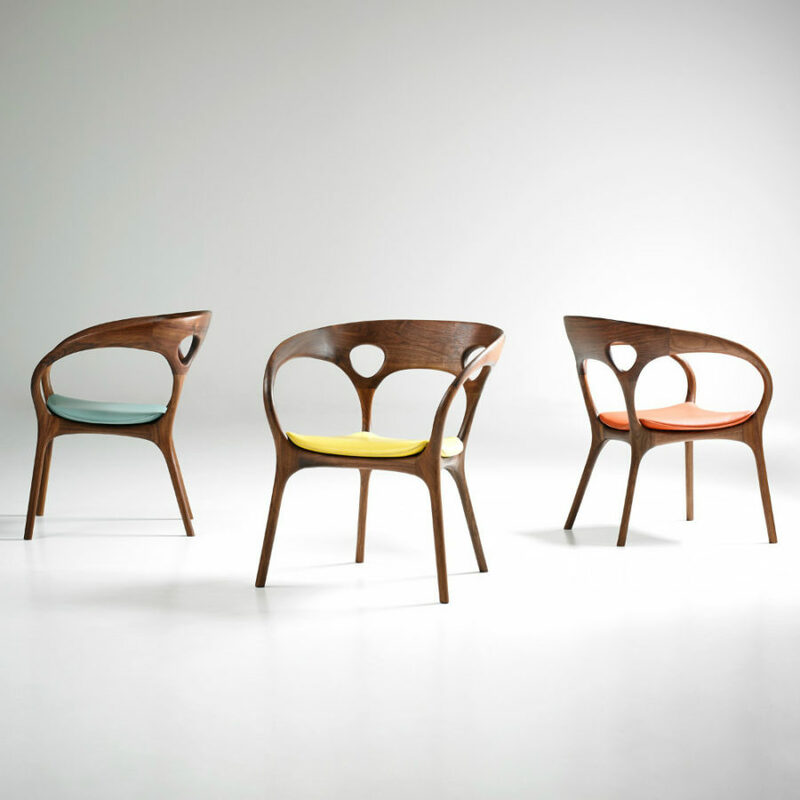 Matthew Hilton designed his Manta chair for a furniture manufacturer De La Espada. 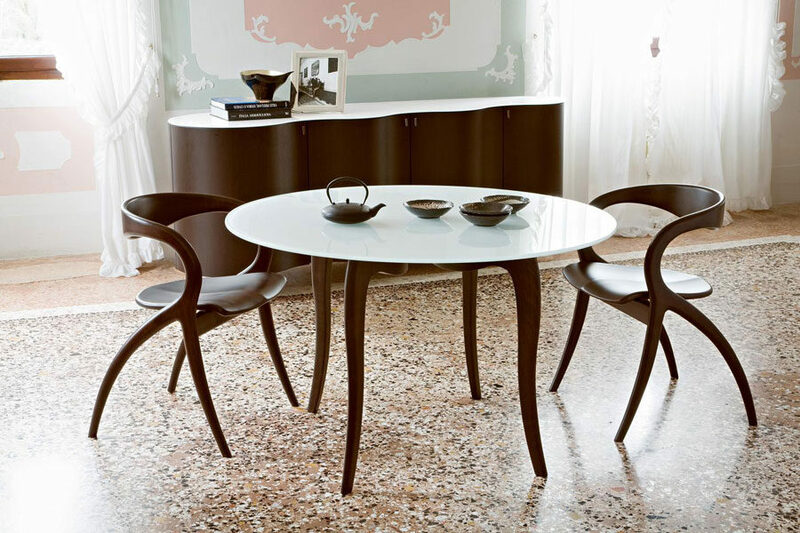 Drawing from the modernist tradition its simple shape is both stylish and beautiful. It also reminds us of both Cherner Side Chair and Ming Chairs. Molded plywood reinforces its modernist vibe but the subtle curved lines make it look exquisite rather than minimal or brutal. Another Christopher Guy creation is Evita. This iconic tall dining chair with a decorated backrest and signature X-shaped legs is bound to make a lasting impression. 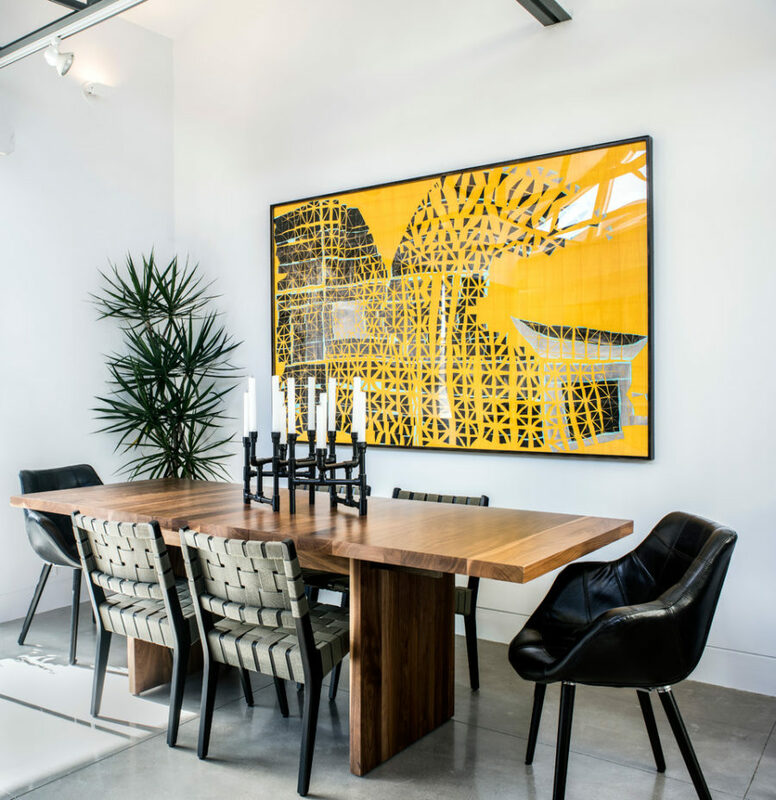 Its elaborate design may seem like it calls for a more traditional interior style, but many of Guy’s similar chairs look equally good in contemporary decor. 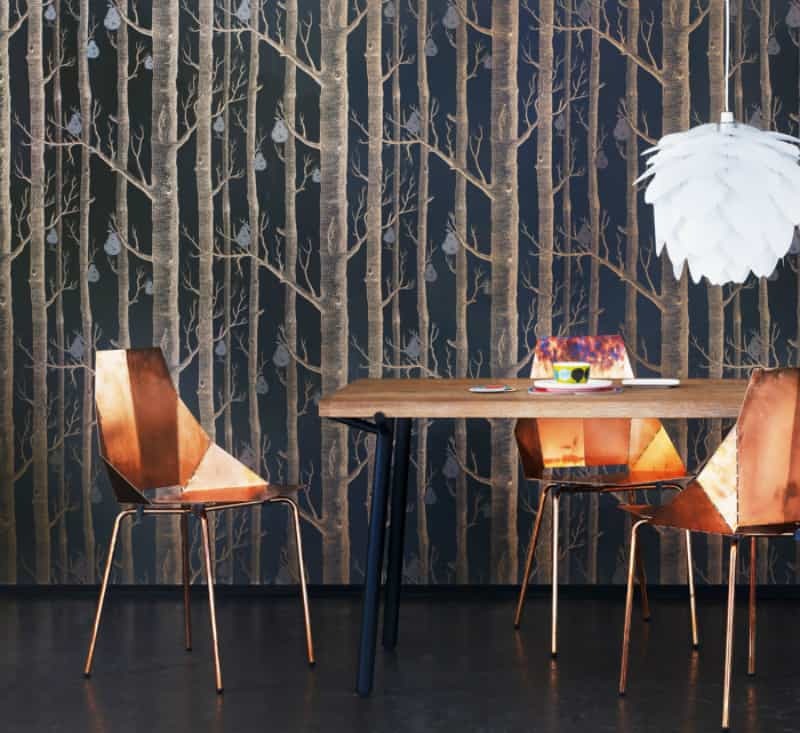 Moooi’s Smoke Chair is a masterpiece of Maarten Michiel Baas. Looking like a baroque revival piece, it features a distinct contemporary design approach and materials. Upholstered in leather the ornate seat is framed in textured burnt wood covered with epoxy for a long-lasting effect. 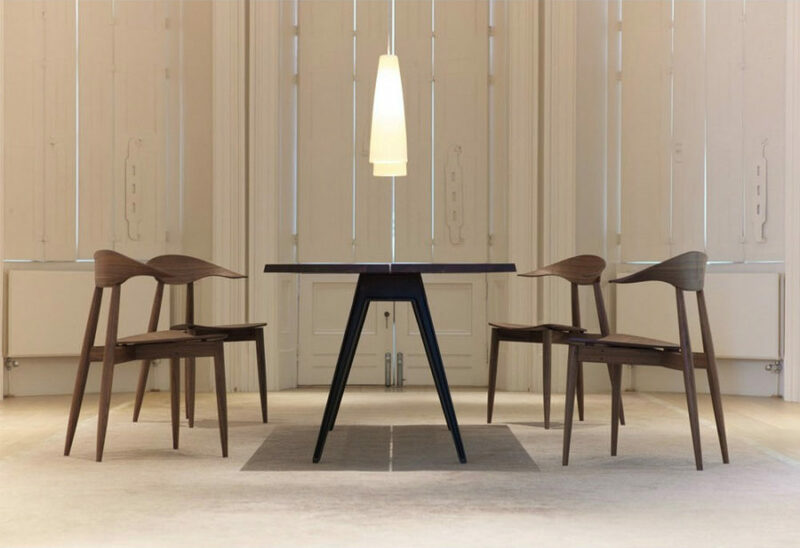 Star Dining Chair by Domitalia is one of the most outstanding modern dining chairs. 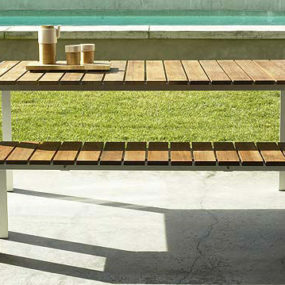 Constructed out of durable beechwood it has a shape that blurs the lines between modern and contemporary styles. Thanks to its designing look the chair doesn’t require any additional finishes or colorful seat cushions. Kartell’s Comback Chair is a creation of a renowned Patricia Urquiola who managed to inject some fun into the formal dining chair design. Shaped after bird cages or something equally decorative these seats attract attention with their very shape rather than color or finish. Channeling elegance and simplicity of mid-century modern design Anne Chair from Bernhardt Design is grace itself. Its wooden frame is flowing and curving in a very organic way. 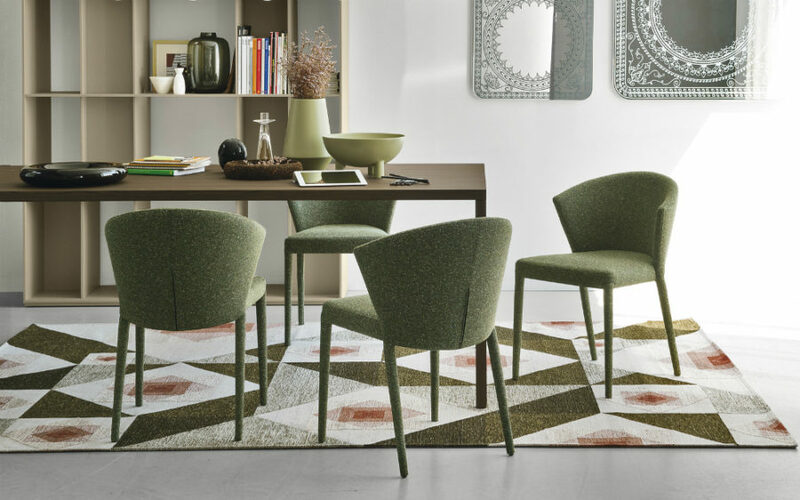 Offered in a series of finishes, Anne chair really taps into the mod style with its thin but bright seat cushions. Louis Ghost Chair by a famous designer Philippe Starck is a modern take on a classic baroque chair in the Louis XV style. 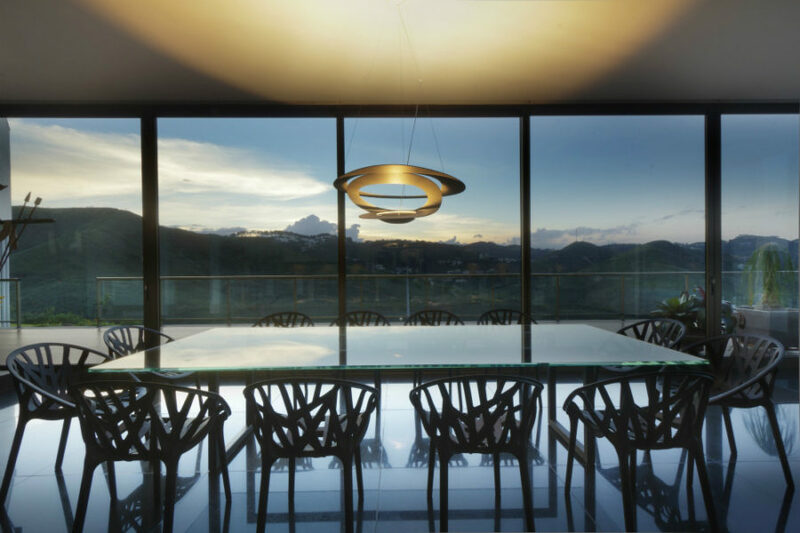 Made out of clear and colored polycarbonate the ghost chair is both dazzling and functional. Weather-resistant, it is more than suitable for outdoors as well as indoors, providing both style and airiness to decor. 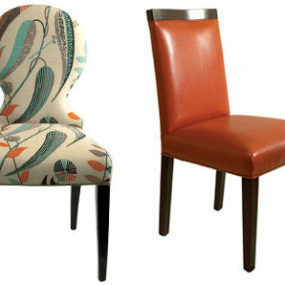 The only downside to these particular modern dining chairs is their high cost. 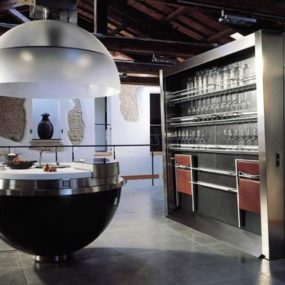 Thanks to furniture manufacturers, though, you can always find a similar design for less.